This is obviously amazing on face, especially knowing that they’re actually putting this on the scoreboard at Phillies games, which implies: A) This is something the Phillies — or at least their scoreboard operators — expect the city of Philadelphia to rally behind and B) There probably exists something equally goofy of Shane Victorino. If you look closely, you’ll notice that this is clearly the work of a master Photoshopper working off this promo image for the 1989 Patrick Swayze movie Roadhouse and not a staged Hamels re-enactment of said image. Our man Cole can’t boast guns like those or hair like that. Presumably the scoreboard gimmick seen here puts players’ faces on their film heroes, like something you’d pay 18 bucks for at an amusement park when you were 7. 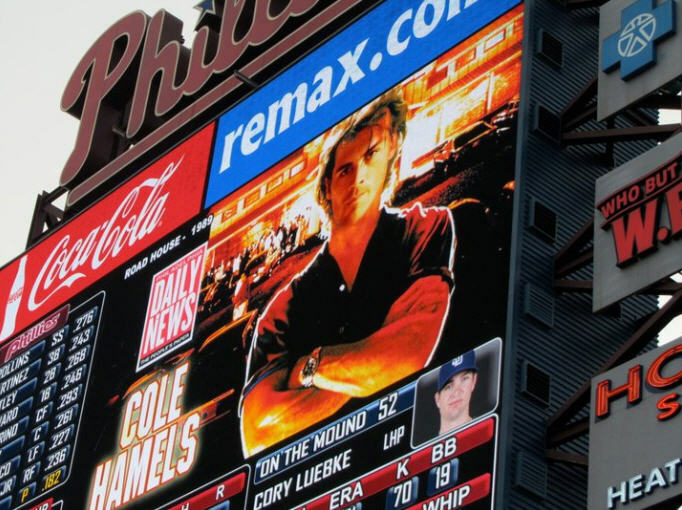 Since the earliest days of the Embarrassing Photos of Cole Hamels archive, I have resisted the urge to include Photoshopped images of Hamels, mostly because there is no shortage of undoctored embarrassing photos of Hamels.